Hmmm. This is the place that my person has decided is our turnaround point. 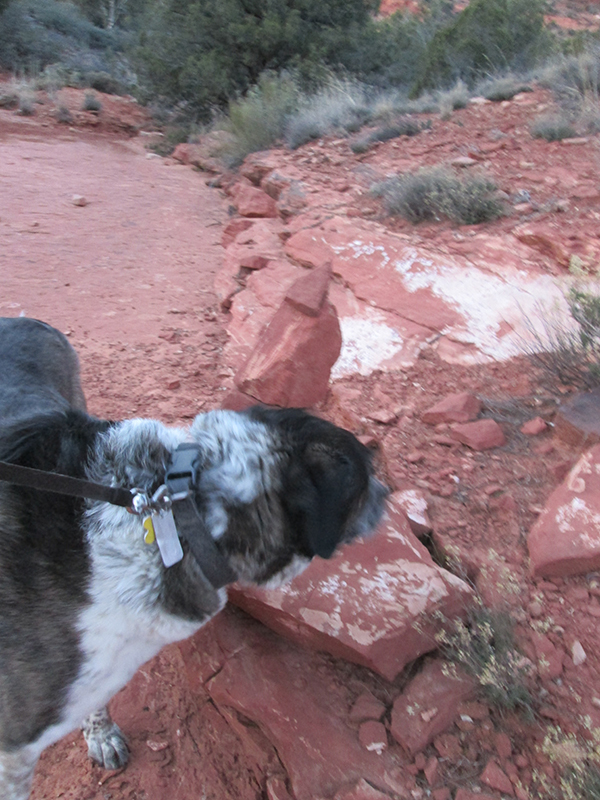 We usually go out this far on my trails and then we head back when we get here. Most of the time I want to keep going, but my person won’t let me. She always has an excuse. She’s too busy, or it’s too cold, or whatever else she can come up with. She pulls that busy one most of the time though. But there’s something different here today. I’ve never seen this here before. There’s an arrow here pointing further out on my trails. That’s got to mean something. Today’s the day we keep on trekking. Hey person, come on. This way! I’ve watched you driving before. When there’s a sign pointing a certain way you follow it. Well, there’s a sign pointing this way on my trails. We have to follow it. Person, I don’t believe it! You’re going to ignore this sign and make me go back? You know, you’re taking your chances. I sure hope the trail police don’t find you and give you a ticket for failure to follow directions. WHAAAAAAT?!? Your human is addled brained, I think. Following arrows is hard wired into the human brain! Next time, Bongo. Next time. FleaByte, I think my person had to work really hard to keep from following that arrow. I don’t know why she doesn’t just give in and do what’s natural. Fredrieka, that’s what I say. There are so many more things to explore. One of these days Bongo. One of these days! Kimberly, maybe if that arrow started flashing my person wouldn’t be able to keep from following it. Now I just have to figure out how to make it flash. Don’t you know it Lily. Oh Bongo, what amazing things could be just beyond that point?!? You will never know if your human never goes any further! You could be missing out on something great. I sure hope next time your human follows directions! 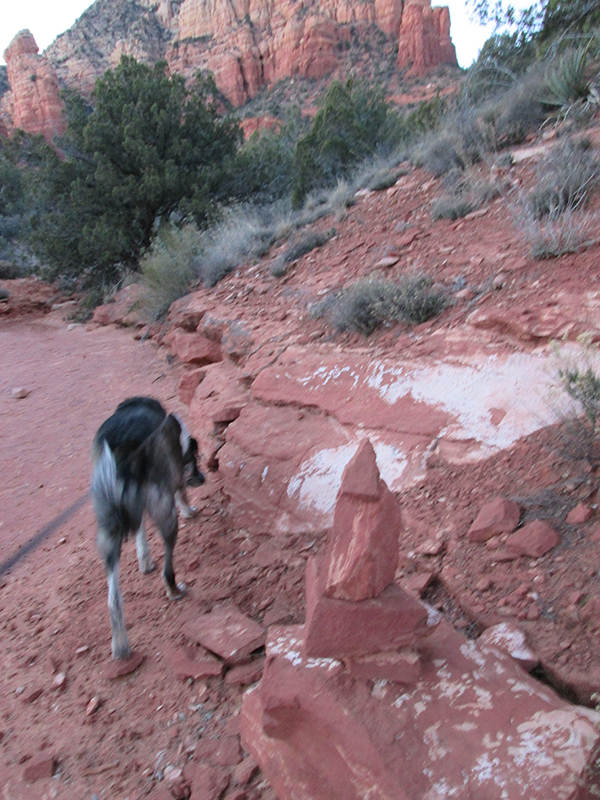 Oz, one time when I did get my person to go further that way we found a little room that someone had built out of stones. There’s got to be more surprises if we keep going further. Marina, my sad eyes worked on my younger person. Maybe they’ll work on my person too. Otherwise maybe I’ll try that telepathy thing – and some mind control. Marina, that arrow fell over so now I have to come up with something new. OMD! Bongo, I sure hope she DOES get a ticket so that your person can learn and you can go farther on your trail next time. FireBonnet, it would definitely teach my person a lesson. Smart dog – not good to ignore a sign! Karen, my person and I should be doing lots of walking, to make up for all the people in places where it’s too cold to walk outside. You do put up with some mischief from your person don’t you!! Dalton, my person is full of mischief. I’ve got to get her retrained. Kevin, I’ve been up that way before – a long time ago. I didn’t find any puddles, but I did find a little room someone made out of rocks. I’m not sure how I’m going to get my person back there now though because the arrow fell down. You know what’s a good trick Bongo? Act like you’re totally exhausted, roll on you back with your tongue hanging out & all 4 in the air. She’ll give you a break & then when she’s let her guard down, act disoriented & follow the arrow. Lola, I’ll have to give that a try. Usually I just stand my ground and refuse to budge. Sometimes my person pulls my collar right off when I do that, but she tightened my collar. Little Binky, I thought people were supposed to follow directions. Snoopy, I never got another chance to follow that arrow either. It fell.